Sub-Saharan Africa (SSA) presents a unique set of opportunities and challenges when it comes to financing, constructing and maintaining infrastructure. Now Africa’s largest sovereign infrastructure investor and trading partner, China has been undeniably changing the infrastructure landscape of Africa, with the Belt and Road Initiative (BRI) driving further investment. The UN is forecasting SSA’s population to double to two billon and for the urbanisation rate to reach 58% of the population by 2050, from 40% today. That said, SSA remains ranked the most challenging region in the world to do business in the World Bank’s ease of doing business index, scoring amongst the worst in the world for indicators such as; transparency of the construction permit process, protection for minority shareholders and electricity accessibility for only 43% of the region’s population. Revised estimates of Africa’s infrastructure spending requirement range from US$130bn-170bn annually, with the current funding gap comprising US$68bn-$108bn, according to the African Development Bank. Encompassing power, transport, telecoms and water infrastructure, two-thirds of this investment required is needed for construction, and the remainder for maintenance. China has emerged a key stakeholder in SSA’s infrastructure growth over the last decade, with added impetus under the BRI. Identifiable infrastructure investment flows averaging US$ 12.6bn over 2012–2017 from China via commercial banks, policy banks and corporations (figure 1), eclipse the next largest sovereign investment flows from France averaging US$ 2.2bn, according to the Infrastructure Consortium for Africa (ICA). Despite 30 SSA countries receiving a total US$107bn of debt relief under the IMF-World Bank 1996 “Heavily Indebted Poor Countries” & 2005 “Multilateral Debt Relief” initiatives, the region’s public sector entities remain constrained by their financial capacities and in house expertise to develop infrastructure project pipelines. Highlighting the severity of fiscal constraints faced by low income SSA countries, 10 countries are currently at high risk of entering “IMF debt distress”, the IMF’s classification of unsustainable public debt service, and a further eight countries are currently in IMF debt distress. The SSA public sector must contend with its limited ability to recover the cost of projects due to high poverty levels and inefficient taxation systems. With median tax revenue-to-GDP of the region estimated at 15% in 2016 by the IMF, well below the 25% threshold estimated to be needed to sustainably increase public infrastructure spending. The majority of identifiable state allocations for infrastructure in SSA were estimated to lie within the 2–4% of GDP range in 2017 according to the ICA, with total regional state allocations in 2017 almost identical to 2014 (figure 1). However, the majority of allocations remain below the 5–6% of GDP spend on infrastructure recommended by development agencies, needed to support reaching the UN Sustainable Development Goals on reducing poverty. With central government capital expenditure for the median of 18 Fitch-rated SSA sovereigns (likely to be richest of the c48 SSA countries) at 5–8% of GDP (peak at 8.4% in 2011, declining to 5.5% in 2018). According to the Fitch Solutions Key Projects Database, China’s identifiable SSA infrastructure debt financing overwhelmingly consisted of policy or commercial bank lending to government authorities (also see figure 2), either independently or as part of a consortium of developmental financial institutions. Chinese commercial lenders (who follow their Chinese corporates clients) were observed to be significantly less active in private infrastructure financing, compared to their lending activity in extractive industry projects, such as mining, oil and gas. Of the 56 SSA infrastructure projects with a Chinese sponsor from 2014–2018, 66% of projects were financed by Chinese state owned enterprises (SOEs), as opposed to the usual sponsor — the Government of China. The majority of SOE sponsored projects are still in the planning stage, highlighting their novelty. Within this new trend, many SOEs would invest under a PPP framework, Ghana and Kenya stood out for receiving a large share of new projects sponsored by SOEs. These countries generally ranked highly for enabling regulatory environments by the Boston Consulting Group (BCG), ranking 7th and 9th out of the SSA countries respectively. Suggesting SSA countries with more robust regulatory frameworks are being sought out by SOE sponsors, a trend we anticipate to continue as China diversifies away from infrastructure lending and as African governments diversify their infrastructure financing. The BRI has gained international notoriety for providing a framework for both Chinese construction firms and investors to facilitate infrastructure development in Africa. With considerable operational leverage, it is now estimated Chinese companies’ control of 50% of SSA’s engineering, procurement and construction market, according to McKinsey. It is no secret that under the BRI framework, Chinese commercial and policy banks align terms of the infrastructure financing with participation of Chinese construction companies on the underlying project. 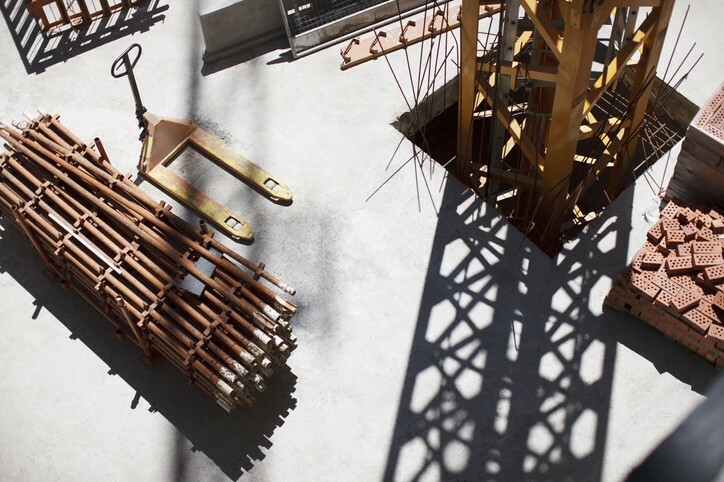 Whilst this may increase construction risks for those projects, Chinese construction firms may actually be driving down infrastructure construction costs across the region, due to their technical expertise. With SSA infrastructure construction costs and timelines reported to be 20%-30% higher than in developed countries by BCG, potentially reflecting governance and logistical challenges. Surprisingly, from 2010–2017 Chinese construction firms won 32% by project value, of all internationally competitive civil works bids with World Bank financing in SSA. Given the next most successful country was India, with a 9% share, it is clear Chinese firms are capable of competing on infrastructure delivery, leveraging their technical expertise and supply chains to lower the resultant project construction cost. The rapid expansion in announcements of infrastructure credit that the BRI has provided also brings sizeable risks to the African sovereigns and their individual projects. There has been a rush to generate projects, particularly in power and transport (figure 3), with increased execution risks arising from political motivations potentially driving project selections over genuine infrastructure needs and commercial logic. Infrastructure development can be a double edged sword, as whilst it can undoubtedly catalyse rapid economic development it can also become a heavy fiscal burden on a government. Smaller African countries that may lack the institutional capacity and experience to assess project risks may be more vulnerable. The rise in general government debt for the median of 18 Fitch-rated SSA sovereigns from 29% of GDP in 2010 to an estimated 55% in 2018, partly reflects substantial spending on infrastructure projects. In Tanzania, the BRI-associated US$10bn Bagamoyo Deepwater Port and Special Economic Zone project — a joint venture between the Tanzanian government and China Merchants Holdings International — was initially suspended in 2016 for lack of funds. The funding constraints faced by the Tanzanian government meant that the government had to forego its equity stake, and thereby risk losing project ownership and access to long-term revenues from the project. There has also been scaling back or cancelling of BRI-related projects in some African countries. Sierra Leone has cancelled plans to build a China-funded new airport outside the capital, Freetown, due to be completed in 2022. With Chinese construction firms responsible for building 50% of new infrastructure projects in SSA, according to Deloitte, risks may arise from over-exposure of the larger Chinese state-owned enterprises that build, operate and invest in many of these projects — a number of these enterprises are highly leveraged to support their increased investments under the BRI. However, recent developments suggest that China is seeking diversify its BRI-related debt financing with more foreign direct investment, public-private partnerships, and equity investment. We expect this trend, along with some scale back or cancellation of riskier projects in Africa would help alleviate some of the funding burden of the Chinese companies and exposure of Chinese banks to the African projects. Bankability of infrastructure is known to be highly sensitive to project delays, cost overruns and cash flow stability. These risks are exacerbated by SSA’s lack of creditworthy counterparties, high proportion of greenfield projects, limited domestic technical expertise, currency mismatch and uncertain project revenues. Conscious of these risks, private investors have sought to invest into SSA infrastructure alongside cornerstone investors, such as multi-lateral development banks that provide additional support and guarantees. A number of international and private participants are increasingly investing towards closing the African infrastructure gap. Investec Asset Management has signed a strategic partnership agreement with the USD 10bn China-Africa Development Fund (CADF), to cooperate on future investment in Africa across PPP’s, energy and transportation opportunities. Additionally, Allianz Global Investors (AGI) committed nearly $120 million, structured as a 12-year loan to the Emerging Africa Infrastructure Fund (EAIF). In doing so, becoming the EAIF’s first insurance investor. While it appears there is a turning point for institutional infrastructure investment across the African continent the Blackstone Group has recently pulled back on plans to invest billions of dollars across African infrastructure, stating that competition from China being a key factor of contemplation. Structural issues of inefficient governance and a lack of infrastructure construction and maintenance, has resulted in unsustainable infrastructure development throughout Africa –going as far back as the 18th century. Whilst this could change over time with help from the developing China-Africa relationship, especially as it pertains to political partnerships. 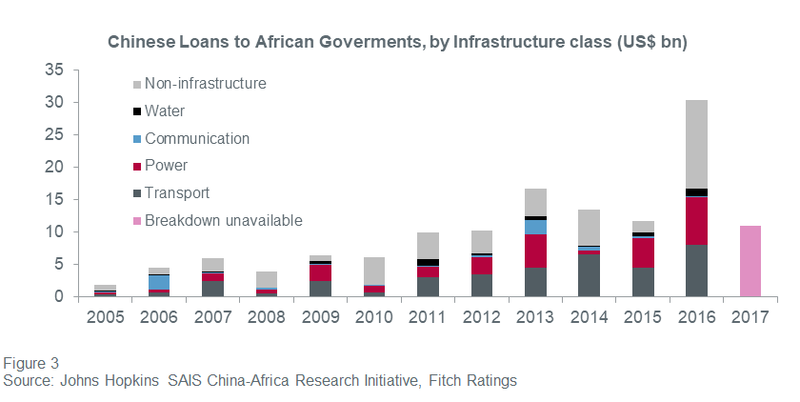 There is also an argument that China is developing too much unnecessary infrastructure (and with it, debt) in SSA. The upside being that whilst some infrastructure gaps are being addressed that would not be otherwise, it is coupled with the obvious downside risk of a potential fiscal, economic and financial crisis. A primary challenge for Africa will be balancing new infrastructure development with successfully implementing already funded projects. It would also involve balancing genuine infrastructure needs with sound economic rationale. China’s involvement in African infrastructure will continue to grow as Chinese banks and construction firms leverage the success and learnings of initial projects, and as investment diversifies away from lending. This will reduce the regional infrastructure gap and help to reduce systemic poverty and increase GDP growth. That said, Africa’s infrastructure is in need of private capital with increasing opportunities for international developers and international investors to provide assistance.